Google Docs is one of the Google Products known use of the internet. This product called Presentation, it's just like Microsoft Office PowerPoint presentation. It's a highly organize and friendly user interface with ready made to use templates for your slide presentation of your documents. The best of this application is online base, that you can collaborate your presentation documents through the internet with your colleagues and business partners. And you can upload your files from any office application easily. Available templates are: Education, Student Certificates, Work, Personal. More templates are base of the common design, that usually use in our presentation application. As you are beginning of this application by using the internet, you can open this application using your browser, you can use this link: Google Docs Presentation, and below the parts and function of the user interface. So that you may know and familiar the environment of this application. TITLE BAR- situated at the top left side of your screen and below of the URL address bar. You can change easily the title by clicking the bar with the default name. DROP DOWN MENU- Situated below the title bar, it's a group of menu name with a drop down mode. Once you click it, it will go down and you can easily now select your command. The menus are: File, Edit, View, Insert Slide, Format, Arrange, Tool, Table, and Help. STANDARD TOOLBAR- It's a toolbar located below of the Drop down menu, it's a command presented as a button, you can click this easily to apply it in your application. They are: new slide, print, undo and redo, zoom in/out, text box and etc. you can click on the buttons situated right to display as your task manager position on the right side of your screen. SORTER PANEL- A position left side of your slide template, it is used to arrange consistently your slide document or a template that you can use for your application. SLIDE TEMPLATE- It's the biggest part of the user interface application, it's a part where your slide and template will display in a beautiful manner. You can add text and design by using the drop/ down menu above of the application. TASK MANAGER- position right side of your slide template, you can add this task manager by selecting a menu in the right side of your standard toolbar. Like themes, background, layout, and transition for your animation. You can start your presentation by clicking the command buttons, position above of the task manager. 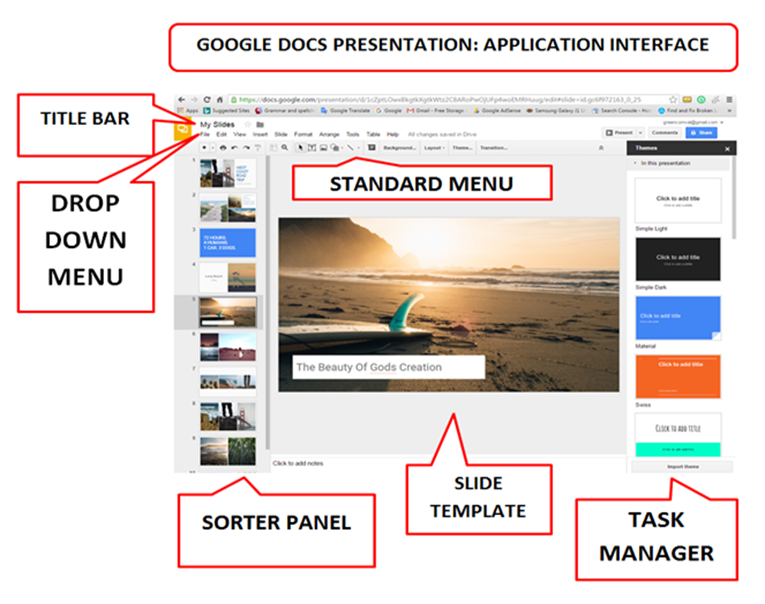 You can apply comments and also you share your presentation with your colleagues by click the command buttons position right side of the present buttons above of the task manager. Thank you for your visit here, you have a nice site.